High Halstow Community Site | Bird Strike In The Thames Estuary??? Bird Strike In The Thames Estuary??? Is there already evidence of Bird Strike in the Thames estuary? Since 1941 the estuary seen at least 4 deaths that could be attributed to bird strike and to this day they remain unexplained. 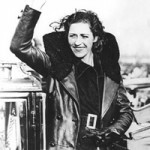 Amy Johnson the celebrated aviator, first woman to fly solo from Britain to Australia, died in suspicious circumstances on 5th January 1941 after crashing into the Thames estuary in adverse weather conditions. It is reported that there was a passenger traveling along with Johnson on board the “Airspeed Oxford”. The precise reason for the fight is still a closely guarded government secret. An attempt to save the couple was made by Lt Cmdr Walter fletcher of HMS Haslmere, sadly all three lost their lives in the unforgiving waters of the estuary. In an interview with the Late George Jewell, then a tall, sprightly 81 year old gentleman who was often seen strolling through the village of High Halstow, with his dog ‘Honey’. Among his fond memories is a photo taken in the Summer of 1946, less than a year after the end of the 2nd. World War. 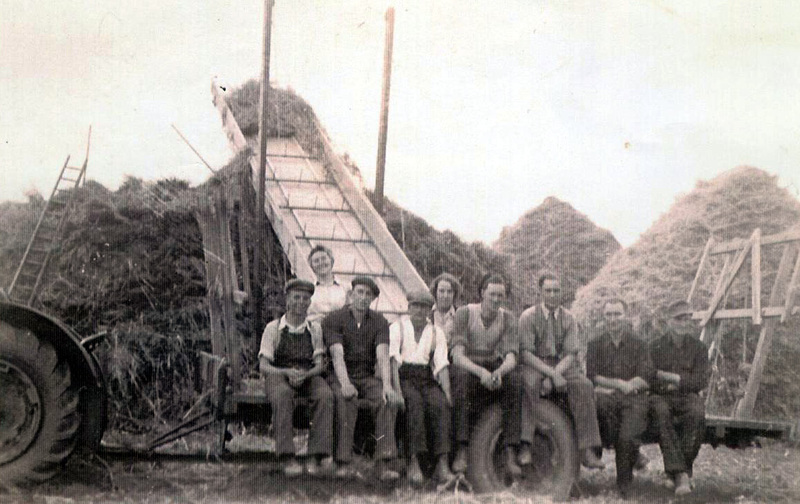 It shows him as a strapping 20 year old farm hand, with other farm hands, land army girls and German prisoners of war, harvesting on the North Kent marshes. 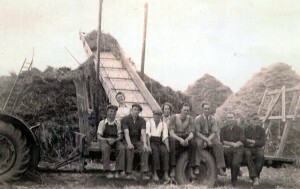 They were all working for Hill Farm (now Hill Farm Close, Christmas Lane) the photograph being taken by their boss, Brian Rayner. But the peace of their warm, happy, summer’s labour was shattered by a supersonic bang, and a startled George Jewell, looking up to the sky saw the tragic demise of a graceful swallow. For the booming explosion was the end of a Dh108 Swallow, and its pilot, Geoffrey deHavilland (Chief Test pilot for his father, aeroplane designer Sir Geoffrey deHavilland) George describes seeing pieces of this experimental jet plane disintegrating upwards and outwards like an exploding jig saw puzzle and watching horrified as one entire wing spiralled down into the estuary. The Dh108 Swallow, which was designed with experimental swept back wings, was the first turbo jet to reach mach 1, the speed of sound, and the supersonic boom as this was reached was both the death knell of its brave young pilot and the very first time such sound was heard over Great Britain, and of course, High Halstow. There were only three of these experimental aircraft ever built, the first taking to the skies on the 15th May, 1946. The first two crashed during trials but the third was more successful for Group Captain ‘Cats Eyes’ Cunningham flew it to become the first pilot to break the speed of sound, in a turbo jet, and live. Our children might well blame the late Group Captain Cunningham for being made to eat carrots, as their great grandparents will no doubt explain. The Dh108 was a prototype of design for the Nimrod aircraft and the ill fated Comet. This entry was posted in Blog and tagged Airport, amy johnson, bird strike, christmas lane, farm hands, george jewell, north kent marshes, prisoners of war, thames estuary. Bookmark the permalink.